Demonstrates usage of cube map textures and texture blending. 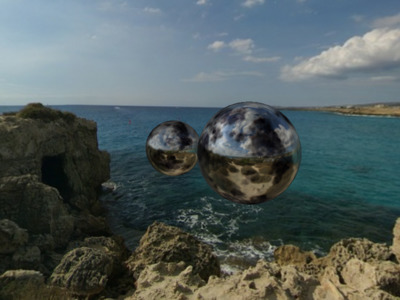 Simulates open world with two tarnish reflective spheres in front of the camera. This example also demonstrates usage of scene graph, resource manager and pre-made primitives. The application will then load ~/images/city+x.jpg, ~/images/city-x.jpg etc. as a cube map texture. Arrow keys rotate the camera around the spheres. It is not possible, due to nature of the cube map projection, to move around the scene. The sample images provided in this example are work of Emil Persson, aka Humus — http://www.humus.name, licensed under a Creative Commons Attribution 3.0 Unported License. Full source code is linked below and together with assets available in the magnum-examples GitHub repository. The ports branch contains additional patches for iOS support that aren't present in master in order to keep the example code as simple as possible.